We are ready for a new spectacular season! 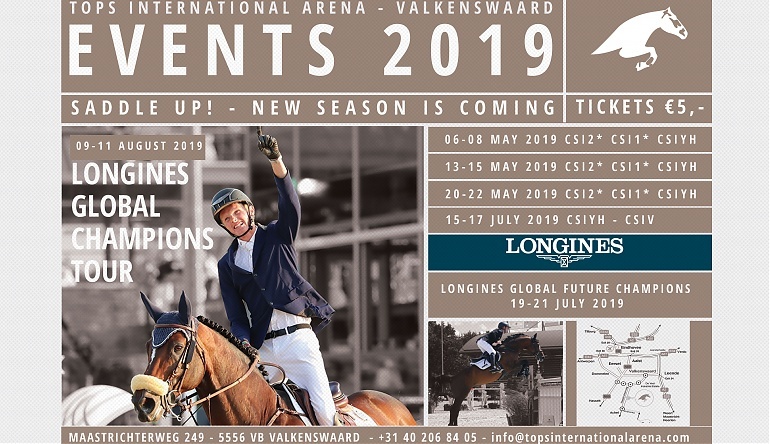 After the great success of 2018, there will again be things to do at Tops International Arena in Valkenswaard in 2019. Tops International Arena is more than show jumping! In addition to the competitions, there is a wide range of nice shops with a cozy bar and restaurants the heart of the Place du Concours: a wonderful place to relax. For your company, there are excellent opportunities for relationship marketing, networking and brand awareness for regional, national and international companies. In consultation each individual sponsor wish is realized. In addition to the sponsor opportunities which we can send you on request, there is of course the possibility for a tailor-made sponsor package or promotion in good mutual consultation. The kick-off of the season will take place on May 6 with CSI1* and 2* as well as competitions for young horses spread over three days. We repeat this formula for 3 weeks, but with new riders and horses. In July the program resumes with the Longines Global Future Champions. The first three days, Monday 15 July to Wednesday 17 July, are all about young horses from 5 to 8 years old. From Friday, July 19, the youth Tops International Arena upside down, from pony category to Under 25 riders. The season ends with the spectacular Global Champions with the Longines Global Champions and the Global Champions League. The entire world top will be present and you can count on top sport and excitement. Show Jumping at the highest level. Welcome to the home of show jumping, welcome to Tops International Arena! 24/10/2018 We are ready for a new spectacular season!